Alice’s Little Parade was first released on February 1st, 1926, and was part of the Alice Comedies series directed by Walt Disney. 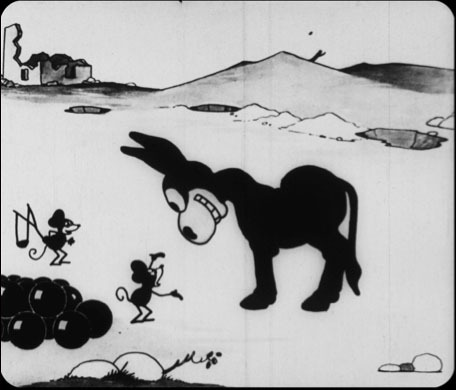 The series, which consists of 57 silent shorts made between 1923 and 1927, was created by Walt and animator Ub Iwerks. The film stars Margie Gay, the second of the four girls who played Alice throughout the series, alongside her faithful animated cat pal Julius, who looks suspiciously like Felix the Cat towards the end of the series. As has been the case with a number of silent era cartoons and shorts, this title was scarce and to get as complete a print as possible required using multiple film copies. Margie Gay, the second of four actresses that played Alice with her animated pal Julius. In this case, Alice’s Little Parade was sourced from surviving 16mm and 35mm prints courtesy of Tommy Jose Stathes. Digital scans were done of both prints and the ‘best of’ portions were edited together creating the most complete print known to exist. This was followed by a stunning digital restoration completed by Steve Stanchfield and his team at Thunderbean Animation. As with all restoration efforts, choices have to be made for the sake of the entire film and a level of cleanup appropriate so that the film continues to feel of the time period in which it was made. This becomes a subjective endeavor with the input of more than one individual knowledgeable with the material. It’s not perfect, nothing ever is, but it is the best that can be accomplished with the resources available and no doubt can be improved upon should additional prints surface that are even more complete. 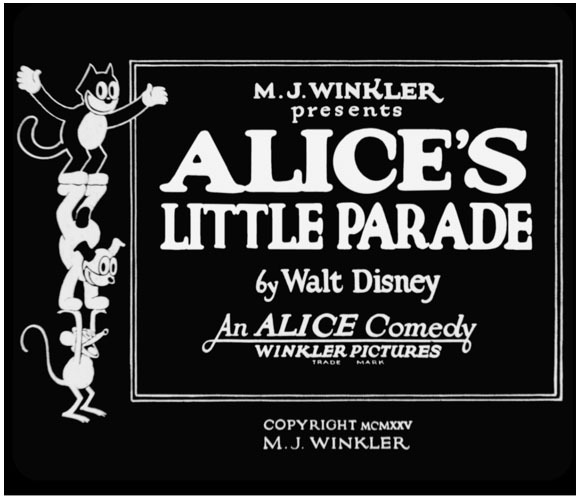 The reconstruction and digital cleanup of this film were only part of the process in the restoration and preservation of Alice’s Little Parade. Music also needed to be added since this is a silent film and had no soundtrack. When first released, before films had synchronized sound, the only audio available when viewing a movie was provided by a theater organist or pianist who accompanied the film with music. Typically, there was no score released with these shorts and the theater keyboardist improvised to the film using mostly public domain music. In the early 1920s, there were sheet music and music compilation books published filled with music in the public domain that was categorized under topics such as “chatter, birds, children, dances, doll, festival, firefighting, funeral, gruesome” and many more. Under each of these headings there could be several musical selections that the keyboardist could use to convey the appropriate feeling to help support the screen action of the film. The music acts as a supporting character for silent films building tension where needed, accenting the action and often enhancing visual gags and comedy. It was the training grounds for what evolved into cartoon music and what became known at the Disney Studios and elsewhere in the industry as “Mickey Mousing,” where the music followed and accented the screen action. Walt Disney enjoyed it when music would “hit” the specific action, though this can never appear to be forced. That philosophy is the bedrock of cartoon music today. Mark Watters is veteran film composer and had scored a number of the recently found and restored Oswald the Lucky Rabbit cartoons. A student of cinema music, he has a sensibility towards the silent film era and a deep knowledge of how scores were constructed during that period. 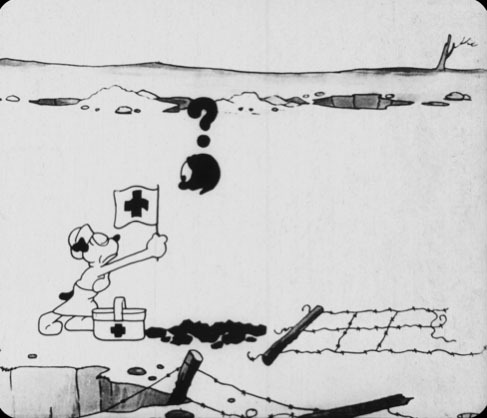 Watters’ work on the Oswald cartoons took its cues from the earliest Mickey Mouse shorts, which acted as a roadmap to how Carl Stalling scored those shorts. Stalling was the first music director at the Disney Studios. A friend of Walt’s from Kansas City, he cut his musical chops as a theater organist and was well versed in using familiar public domain music to enhance the screen action of silent films. Watters had a similar approach in scoring the Oswald shorts Hungry Hoboes, Africa Before Dark and Poor Papa, with each using music that resonated with the audience. For instance, in Poor Papa Watters used ‘This Is the Way We Wash Our Clothes,’ ‘Rock-a-bye Baby,’ and the well-known ‘Brahms’ Lullaby’ and Wagner’s ‘Ride of the Valkyrie,’ which served as the climactic finish. For Africa Before Dark, he chose to use the familiar tune, ‘A-Hunting We Will Go,’ but modified it and other melodies to capture that same “jungle style” of the cartoon. In the discussing the music for Alice’s Little Parade, Watters and I talked about the idea of trying to break away from writing a score that relied heavily on the use of music in the public domain. Obviously, there’s a sensibility to it that evokes another era but there was really no reason why the music had to sound nostalgic. He wanted to write an original score with minimal quoting of public domain music. The use of music in the public domain was prevalent in animation during the late ‘20s and throughout the ‘30s and beyond for the mere fact that it didn’t cost anything—no royalties or licensing fees, it was free. So, for Watters, there was no reason for him to have to us such music when he could compose an original work that had the flavor of the time period. Yet, there was one instance in this new score where he did choose to use a familiar theme and that was called ‘Here We Go-Round the Mulberry Bush,’ which was written in the 1830s. The tune had various titles and different lyrics over the years but most people know the song from childhood— “…here we go-round the mulberry bush, the mulberry bush…” He used that theme because it was appropriate to the screen action in one part of Alice’s Little Parade. “The lyrics of this song are, in a sense, a set of instructions so when two mice are explaining to a donkey how they plan to launch cannonballs with the help of his hind legs, I thought it was most appropriate to use this tune,” said Watters. Here We Go-Round the Mulberry Bush’ was used in this section as an appropriate theme for the screen action. Since the Alice Comedies predate the Oswald shorts, one would think that using more music in the public domain would be appropriate. But, on the Oswald shorts, Watters said, “I think it was more of me wanting to imagine with the Oswald shorts that I was thinking a lot of what would Walt want, if Walt were alive, and he were directing me on what to write for those—what would I want to give him.” On Alice’s Little Parade, “I suppose after doing three Oswald’s I kind of feel confident in thinking that I don’t necessarily have to do that, I can write something that would sound a little more contemporary in places yet still have certain nostalgic qualities.” That does not mean he would have written a Rock or Hip-Hop score, but rather a score that had a vintage quality without it necessarily being from the 1920s. Music is an important part of complimenting and highlighting the screen action in any film—it is a supporting character—especially in silent films like Alice’s Little Parade. Without music, the gags and situations are less impactful and diminish the viewing experience as a whole. Film purists may want to watch silent cartoons with no sound, but that is not how they were intended to be viewed. Before synchronized sound, the filmmakers relied on the theatres to add the music with in house musicians and sometimes even supplied scores like Charlie Chaplin did for some of his films. I prefer to view animated films from the silent era with a robust music score that is composed expressly for each individual cartoon so that I can be fully absorbed in the cartoon experience. If you have not had the opportunity to see silent films with live musical accompaniment, I urge you to jump at the next opportunity. Seeing these films in a vintage theater with a twenty-eight-piece orchestra is a completely immersive event and the best way to experience these cartoons as far as I’m concerned. The new score for Alice’s Little Parade, written by Mark Watters, premiered on February 10th, 2018, to a robust crowd in a program titled Animatus Eventus (Cartoon Suite), presented by the Riverside Philharmonic at the Riverside Municipal Auditorium in Riverside, California. The music was conducted under the baton of Maestro Watters. Alice’s Little Parade will be screened at other events and festivals in the coming year. 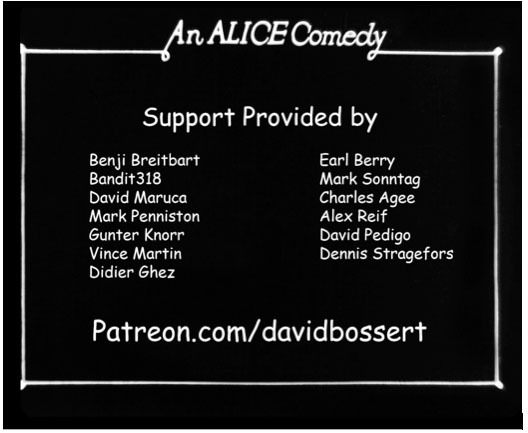 The entire project budget was raised through the Patreon platform that allowed for crowd funding the support necessary to complete the restoration and preservation of this film. Those at the Executive Producer and Producer support levels received credit at the end of the film. 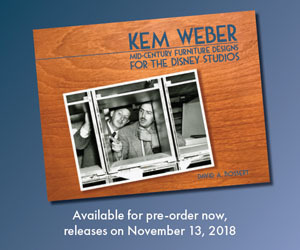 If you would like to become a supporter of restoring and preserving scarce and lost cartoons, please visit www.patreon.com/davidbossert. For those who are not familiar with the Alice series and are curious, the other two girls – beyond Virginia Davis and Margie Gay – who played Alice were: Dawn Paris, a.k.a. Dawn O’Day, a.k.a. Anne Shirley several years later (she appeared in only one Alice Comedy, “Alice’s Egg Plant,” which has survived), and Lois Hardwick for the last ten Alice Comedies (1926-7). Russell Merritt’s 1994 book “Walt in Wonderland” is invaluable for the Alice series of cartoons. The background sound available for most of these cartoons in the public domain is really irritating, in my opinion, because it has little “ha-ha-ha” sounds throughout the pictures that have little bearing on what’s going on on screen. Any move to get rid of that junk is much appreciated. I sure would like to see Disney release _all_ of the surviving cartoons in that series, restored, and with new music! I can’t fathom the process behind writing all new music for cartoons that weren’t made with sound in mind and weren’t even always screened at 24fps, and how much the littlest change in the framerate can influence the timing of the music to the picture because the music would so closely follow the action on the picture. Sometimes it works well with the same beat from start to finish, sometimes a little tweaking must be done. Sounds like a whole load of extra work was done there! Interesting that you cite both “This Is the Way We Wash Our Clothes” and “Here We Go ‘Round the Mulberry Bush” – songs that I learned in childhood, with the same melody. 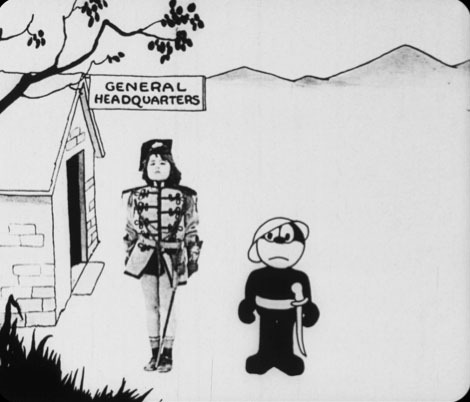 When I saw the restored print of the Oswald cartoon, “Poor Papa”, I liked it, but couldn’t help thinking: “Where’s the song “Poor Papa (He’s Got Nothin’ At All)” in this soundtrack? The original song was composed by Harry Woods and Billy Rose in 1926, and the Whispering Jack Smith record of the number was released in July, 1926. The Oswald story in “Poor Papa” was obviously suggested by the song which came out about a year prior to it’s release. It’s too bad that the song wasn’t incorporated in the musical track, no doubt the song is STILL not in the public domain due to the infamous Sonny Bono and Digital Millennium copyright acts. The Disney Company could surely more than be able to afford the music rights to the song, heck, they could probably afford to buy the entire catalog of songs held by the Billy Rose interests, or whoever owns the rights. I think that hearing the music track to “Poor Papa” WITHOUT the song that inspired it, feels really incomplete. Yes, Mark, amazingly the song “Poor Papa (He’s Got Nothin’ At All)” is still very much under copyright by Bourne Co. They do license music for film. I wonder why, given the excruciating methodology involved with doing scores for these silent Disney cartoons, they didn’t try to include the song of this cartoon’s namesake? Oh for those innocent days when the accompanist just played what he pleased on the Wurlitzer without worrying about the “rights”.